Standard production time is 5 -7 days. 2-Day Rush service is available. The prices shown below are for orders of 50 badges. The more badges you order, the lower the price! 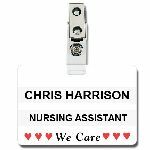 Our larger Stock "We Care" name badges are made of durable laminated vinyl and come with a strap-n-clip attachment. Prices range from $1.95 to $.95 each. 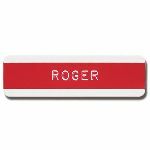 In-Stock Name Badge, Size: 3/4" x 2 3/4"
In-Stock White Molded Plastic Name Badge with 1/2" recessed slot. Prices range from $1.85 to .79 each. 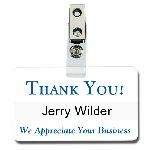 In-Stock "Thank You" Name Badge - STY1 includes F-1 Strap-N-Clip. Prices range from $1.45 to .69 each. In-Stock "Hello" Name Badge with pin. Prices range from $1.25 to $.56 each. In-Stock "Welcome" Name Badge with pin. Prices range from $1.25 to .56 each. 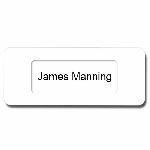 In-Stock Blank Name Badge, Size: 1" x 2 3/4"
In-Stock Blank White Vinyl Name Badge with safety pin. Prices range from .99 to .39 each. 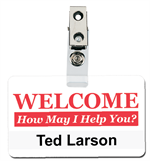 In-Stock "Welcome" Name Badge with strap-n-clip. Prices range from $1.45 to .69 each. In-Stock "Welcome" Name Badge with Magnet. Prices range from $1.99 to $1.65 each. 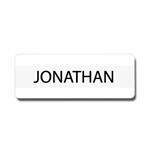 In-Stock "Hello" Name Badge with Magnet. Prices range from $1.99 to $1.65 each.